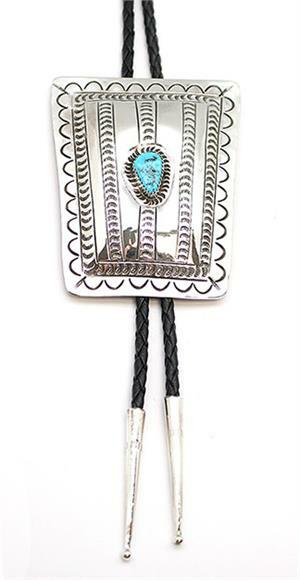 This bolo tie has a stamped rectangle shape concho with a free form sleeping beauty turqoise stone in the center. It measures approximately 3" long by 2 3/8" wide at top and tapers down to 2" wide. It is on a vinyl cord measuring approximately 44'' long end to end with sterling silver tips. Crafted by Navajo artisan Carson Blackgoat. Size and shape of stone will vary as well as stamped design.